Margaritas, Bloody Marys and Back to Reality. It’s ALL Good! Blood Marys...like a salad in a glass, no? What a nice, relaxing weekend. Thanks, Mitch. The beach was beautiful, finally tried Rocco’s Tacos, (good food, excellent house margarita!) got in the pool, (not enough) bbq’d, and even managed to squeeze in a little work (and very little exercise). In my effort to find balance, I ate and drank a little more than I normally do and enjoyed every last bite and sip. While drinking my bloody Mary on Sunday, I didn’t have a single ounce of guilt over the 450 grams of sodium in just the tomato juice! A time to let go, a time to pull in. Today, I pull back in! I have found, personally, that the best way to pull back in, after over-doing, is to stick to fruits and veggies for just a few days…and drink a lot of water, of course. Eating like this for a couple of days is like a natural cleanse. By sticking to fresh fruits and veggies, it’s easy to keep sodium down, helping to flush the kidneys. Fruits and veggies are very quick and easy to digest. There is no fat for the liver to have to break down and they are filled with fluids, too. This has always helped me de-bloat, hence shedding a couple of “weekend” pounds, and “reset” my brain and hunger mechanism. The best part is I get to shamelessly eat potatoes. I will add them to my vegetable “must-go” which I will be making for when I get home from the gym tonight. Some squash, cauliflower, zucchini, mushrooms and yes, potatoes,(sweet and white) too. Cutting them all into bite sized pieces, I will mix them with some fresh herbs and and some olive oil and let them roast in the oven for close to an hour, turning once or twice while they cook. It’s a great way to have a vast variety of colors and flavors as well as a great variety of nutrients, anti-oxidants and more. Healthy, filling and low in calories. For those that don’t love veggies, try this. It’s also a great way to get rid of the healthy stuff that you had good intentions of cooking but are now just sitting in your produce bin. I can’t wait to watch Extreme Makeover-Weight Loss Edition, which premiered last night on ABC. I will be watching it between my morning and evening of work. Will let you know what I think when come back to cyberspace tomorrow, morning (probably a little tired-eyed after tonight’s Heat game. GO HEAT!!! ) Until then, have a great last day of May. Where, exactly, does the time go? Once called Decoration Day, Memorial Day does symbolize the beginning of the more carefree days of summer. From big, big sales in retail, to family and friends lighting up the grill for burgers, dogs (meat or otherwise!) and corn on the cob, to opening the pool and everyone making their first plunge of the season, this now 3 day holiday weekend, is a time for celebration. Most importantly, however, it is a time to reflect and remember all of those that served, including their families, to allow us to be free to enjoy as we do. While I may never be as patriotic as others, I am always grateful for my freedom and never without respect and appreciation for those that gave and give me this daily gift. Please forgive me if this opinionated blog sounds preachy for it is truly not my intention. It is an outpouring of thoughts that have been circling my mind lately and that I feel worth sharing, because I know the same demon that haunts me, haunts too many of us. In my line of work, it is commonplace for me to hear all the things that people (especially women) wish they could change about their bodies. From losing five pounds to reducing waist, or hips or thigh size, we all have things about ourselves that we wish we could change. As a woman and human being, I tend to be no different. I used to have great abs and though mine are still strong, I surely can’t go to the gym in a sports bra like I used to in my 20s, 30s and 40s and just the other day I was reminded of what great shape I was in the summer I did P90x (thanks, Kyle). Certainly we cant pick up a magazine, turn on our computers or watch TV, without seeing some sort of miracle product that will help us FINALLY achieve our physical goals. It’s not really our fault we are obsessed. We are simply products of the media, advertising and even photoshop. Clearly 100% of magazine covers use modern technology to make their models (famous or otherwise) look as perfect as they do. By now, we hopefully ALL understand this! Lately, I have been thinking A LOT about perspective. Watching the Biggest Loser finale the other night, I was noticing how when people lose a lot of weight they just BEAM with beauty and self-confidence. Someone who was 150 pounds overweight SHOULD beam when they lose 100 pounds. Even though they may still be 50 pounds away from their weight goal, and still considered overweight, (or even obese) they strut their stuff (as they should) and shine. Others of us have close to perfect weights, healthy BMIs and yet we are just focusing on what could be more “perfect.” Personally, I would love to be closer to 120 pounds, than 125 pounds, but should I spend my life wishing I was 5 pounds less when most of the world would give almost anything to be a healthy weight?? As I listen to my students, clients and friends, I hear myself and realize how crazy it sounds to be so obsessed with perfection. I am on a personal goal to start loving my body for the healthy, strong, temple it is. Oprah, on her last day of her show, wanted us all to know we all need a platform. Mitch commented on how lucky I was to have several platforms. I am going to do my best to use my platforms not only to help people with their fitness goals, but to honor my commitment to helping people find peace, for without peace we can never truly be healthy! In order to have peace in the world, we must have peace in our homes and peace in our hearts. In order to have peace in our hearts, we must make peace with ourselves. We all need to work towards a healthy weight goal, because that seems to be the ticket to keeping all our important numbers in check (such as cholesterol, glucose and blood pressure). A healthy diet and almost daily exercise will always remain the best way to achieve a healthy weight. For me, personally, I may never get back into size 4 jeans. I am working really hard not only on accepting this, but on honoring and celebrating the fact that I my 53 year old body is healthy and strong and takes pretty great care of me, in return for my taking pretty great care of it. If I can send ONE message out into the world today, it would be for all of us to stop looking for perfection, because THERE IS NO SUCH THING! Take great care of your temple and then enjoy it. Spend a little less time obsessing on perfection and a little more time on caring for those around us. A few weeks ago Rita purchased a Groupon for a restaurant called The Green Wave Cafe in Plantation and yesterday she took me on a lunch date there. All vegan and raw (except the soup) the place looked like it belonged in NYC, maybe the village, definitely atypical of anything one might find in suburban Broward County. There were only a few tables and a row of seats at the counter, and when we first got there, around noon, only one other table was occupied, but by the time we left at 1, the place was packed with happy diners. The menu has about a half a dozen appetizers and about the same amount of entrees. There is also a big board listing specials, desserts, teas and drinks. Each entree comes with soup or salad and in an effort to taste as many things as possible, we decided to order 2 entrees, one with soup, one with salad and share everything. The staff (I am going to guess it was the owners but that’s just a guess) was very, very friendly and accommodating and they were nice enough to split everything for us. First we had the lima bean soup which was tasty, fresh and wholesome and then a beautifully fresh salad with some sort of apple dressing which was light and very good. We ordered the special of the day, the pesto pizza, and some Mexican lettuce wraps. They brought us each a piece of the pizza, which was more of a cracker crust than than a pizza dough. That said, I liked it a lot. They also brought us each a lettuce wrap (actually unwrapped romaine) filled with guacamole, sprouts and topped with cheese (made from nuts). The restaurant is open Tuesday-Saturday from 11-9. On Mondays the restaurant is closed to allow it to be a farmer’s market, selling organic produce at affordable prices, from 8am-2pm. They also sell some already prepared foods and desserts such as brownies and hearts of joy as well as soy candles and other assorted items. If you are a local (or visiting Broward County) and looking for a place to find some organic, vegan food, give The Green Wave a try. They are located at 5221 West Broward Blvd, Plantation, Fl. 33317. 954-581-8377 or emailed at rawfoodadvisor@yahoo.com. Definitely a very different experience than anything I have had locally. Thanks Rita and thanks Green Wave. So though the day was all about The Green Wave, the night was definitely about waves of red and white. What a wild and nail biting game but in the end it would be our Miami Heat that took the win, the trophy, the title and the chance to take it all against the Mavericks. The Heat is definitely ON! Thanks to a dream team. Love you Lebron. The alarm went off a little before 6 and the great oldies song, “Abraham, Martin and John” was playing. All I could think about was Olivia, (someone) and Lebron. I didn’t yet know that Hines (YAY!) won the mirror ball trophy, but I definitely knew the Heat won (in overtime) and I definitely knew my girls rocked the Biggest Loser. Abraham, Martin and John…Olivia, Hines and Lebron. Thanks to Carol and Jane for coming over and watching all the amazing transformations, and playing guess their weight now. Carol later emailed me with Olivia’s height…5’9! 132 pounds. That is unbelievable as was Hannah’s 120 pound weight loss putting her at 128. At the beginning of the show we learn that America picked Irene over Jay, for the final 3. Good choice, America. Though both of them looked fantastic, and Jay actually looked like he lost a greater percentage at home, than she did. Then we start to see all the eliminated guests return and weigh in. WHERE THE HELL WAS OLYMPIC CHAMPION RULON? They never even mentioned his name. Most looked absolutely fantastic like Ana, Courtney, Marci, Ken, Moses. Sarah, and Austin. Deni lost 131 pounds and no one could beat that number, making her the at home winner of 100 grand! Here’s my takeaway from all of this. Lose weight while you are young. The young contestants still look young. On the other hand, some of the “older” contestants took off a lot of weight, but put on a lot of years, visually. The twins, Dan and Don looked very, very old to me. Deni definitely needs to do something about the skin on her face now, too (and can since she won the money!) Her daughter, Sarah on the other hand, looked drop dead gorgeous at 155. Seriously gorgeous. I wanted Olivia to win since week one. But in the end, I felt badly for Hannah and thought it would be great for her to stand under that confetti, but Olivia had her beat by just enough. Both of them looked so beautiful. I love Hannah’s new hair style. I might want to steal it. Olivia looked gorgeous from head to toe. Great sassy hair cut, red lipstick, knock-out dress and a very thin (he lost over 100 pounds at home) great looking hubby in the audience. Great show, great finale. Next season, Anna Kournakova takes on the job of the new trainer. Should draw some men to watch, that wouldn’t have before…I can hardly wait! But to hold us over, we have a new weight loss show on ABC starting next week. Extreme Makeover, Weight Loss Edition. It’s a 10pm show, so I will definitely be hitting the DVR for that one. NFL player, Hines Ward won the mirror-ball trophy on Dancing with the Stars and definitely earned and deserved it! The Heat overpowered the Bulls in overtime and that was very stressful. I went to sleep for that over-time period as it definitely does seriously stress me too much. Woke right up to learn from Mitch that they won. Phew. Thanks again for the articles that some of you sent me this week. I will be reading and re-reading. The word compassion keeps twirling around in my brain. I am personally trying to do some work with my own compassion level and all of the literature you have been sending addresses just this! Carole, I am relating a lot to pathway number 8, interacting with others…I keep reading those words. I do need to learn that I CAN be compassionate without feeling a need to get caught up or fix what someone else has to to work through. Thank you. It gave me a lot to think about. More about this later. For now, just like the little elves chanted, hi-ho, hi-ho, it’s off to work I go. Have a wonderful Wednesday everyone. Forgive my typing errors. Keep taking care of yourselves, each other and our Earth. Much love. PS. I just learned Olivia’s last name is Ward. Weird. Olivia Ward and Hines Ward. What are the odds?? Season 11 BL Finale…Just a Half a Day Away! I see a theme. A country boy won this season’s Celebrity Apprentice and another country boy is projected to win this season’s American Idol. Does this mean an opera singer will win Biggest Loser? Or is one of the contestants a little bit country? You can all tell my mind has gone a little crazy waiting for tonight’s finale…of BL, that is. Because I am so fixated on tonight’s finale, I was particularly interested in the article Carol sent me about the connection between happiness and compassion. Is that compassion element involved as we watch people re-invent themselves from unhappy, unhealthy and defeated, to happy, healthy and successful with second chances at life? I think it is. I think it has everything to do with that vagus nerve that goes straight to our hearts and makes our eyes tear up. It gets me every single time. I once remember Carole W., telling me about how we really give of ourselves because it makes US feel good. Something some philosopher once said…who was it Carole? Maybe some of us are born more wired to feel good about giving, but maybe all of us would benefit from exercising more compassion in our lives. It seems that when behave in a compassionate way, our brains light up and happiness follows. Perhaps you can give some thought to this as you go through your day. I know I will be. Tonight one of these four will be a quarter of a million dollars richer, but all of them are so much happier, healthier and more terrific than they were last year!!! Sisters Hannah and Olivia, Irene and Jay. Who will be the Biggest Loser?? GO GIRLS! Well, according to my sites statistics this morning, yesterday was THE busiest day ever for peaceandfitness.com. While that is exciting, it also comes with a lot of spammers so I spent a good amount of time this morning, deleting comments from people who just want to get the link to their site EVERYWHERE. Not complaining, just mentioning because it did take a slice out of my morning computer time. I do like to make sure that anything you click on this site is safe. Last week we talked about ways to burn an extra 100 calories, but what if you just want to eat a 100 fewer calories? Here are some easy ways to shave 100 at a time…eat fresh fruit instead of drinking juice, try drinking club soda instead of regular soda, opt for the non-cream based soups, put fresh fruit in yogurt instead of the kind with the fruit already mixed in, and opt for the nonfat yogurt instead of the custard style, choose red sauce over cream-based pasta sauce (and opt for the whole wheat or whole grain pasta instead of the traditional kind), ordering a lunch size meal instead of a dinner size will probably cut a lot more than 100 calories, as will sharing a full sized meal with your dining companion, limit yourself to one glass of wine, instead of two (or more)…you get the idea. There are lots of ways to cut 100 calories here and there along your day. Combine a few of those simple changes and burn an extra 100 or 200 a day and you are easily on your way to losing weight safely and without feeling too deprived or without having to kill yourself for hours in the gym. Making a 500 calorie difference a day will result in about 4 pounds of weight lost over the course of a month. I am off to start burning some weekend calories 🙂 See you at the gym, or right back here at peaceandfitness.com. Have a marvelous Monday! 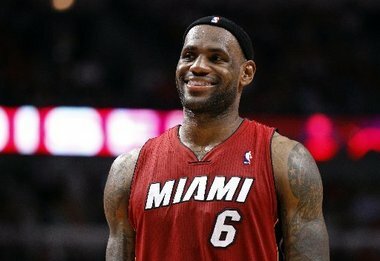 Way to win em, Miami Heat! Just as I suspected, there were no earthquakes of magnitude, the sky did not fall and the world did not come to an end yesterday–not even for the non-believers. How could the world come to an end before the basketball playoffs are over? Or before America decides between Scotty and Lauren. Who WILL be the next American Idol? What about Apprentice tonight? How can the world possibly come to the end in the midst of the television season ending? Really? If there is a g-d, wouldn’t she (or he) give Oprah a chance to air her final 3 shows? I mean, we are talking Oprah. She certainly believes. Would g-d have taken her off the face of this earth without finishing her work? And above and beyond everything else, it would have been really sad if we never got to see who takes the title of Season 11 Biggest Loser. Let’s face it, I have priorities and when it comes to TV finales, this one is it. I will be watching it on DVR after classes Tuesday night. Looking at about 9pm. I think the regulars will be joining me for our ritual, and another season of “guess his or her weight now.” Lots of tears will be shed. I can hardly wait. While Olivia has been my pick since week 1, I think I would rather see her sister, Hannah, take the whole thing. Somehow I feel that Hannah has walked in Olivia’s shadow (a once very big shadow!) and would benefit most from the big win. Now that we know the world ISN’T ready to come to an end, I can rest knowing we WILL see who stands beneath the falling confetti!! Before I sign off for a relaxing Sunday with Mitch, I just wanted to say thanks again to all my SilverSneakers students for your ability to roll with the punches and be so supportive during our move to Tamarac. The first 2 weeks went really well and I am very grateful to you for your support and proud of you for caring so much about your health and wellness. Thanks to Rita for thinking of me while cruising. You do know what I love…coffee and collecting peace 🙂 I look forward to hearing about your trip, seeing your pictures and checking out the food at The Green Wave later this week! And thanks to Erica and Jeff for also bringing more peace into our life, this weekend.